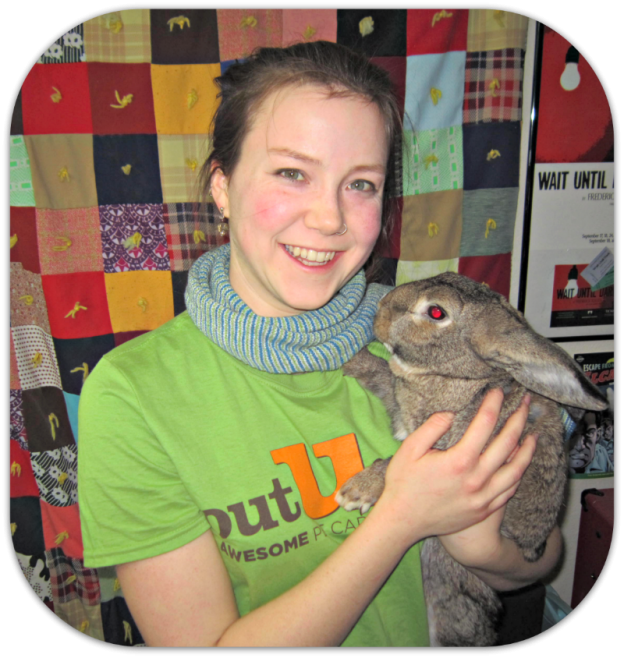 Meet Madison’s Awesome Pet Sitter, Erica! I’m in charge of: I get all those cute pups out the door for some exercise and the ever-important potty break. I also take care of all the critters while their humans are away from home. My furry family: I’ve got a whole critter crew! I have three felines- Rodrigo, Rigamarole, and Wingnut. In addition, there are two bunnies scampering around the kitchen named Porthos and Cosettle, a hedgehog in the bedroom named Phinneus, and a pet mouse in the living room named Bacon. My boyfriend usually has a couple of aquatic-type animals as well. Super power: I could brain storm this one for hours. Hmmm…maybe the ability to speak any language at will? Best Thing Ever: I really love good food and drinks. Hidden Talent: I can roller skate! I play roller derby in my free time. Life Philosophy: Travel often, eat well, and snuggle the pups & kitties! This entry was posted in Madison Mutts and tagged critter, Dog Walker, Madison, Pet Sitter, Wisconsin on April 7, 2014 by Laura Rumage.